Introducing PRIMUS™, a totally proportional electric trailer brake control. Primus utilizes the primary sensor technology from Prodigy and features the Tekonsha® one step "Point and Go" set-up system. Easy-to-set systems allows the driver maximum flexibility when determining how the trailer should respond to a braking event. 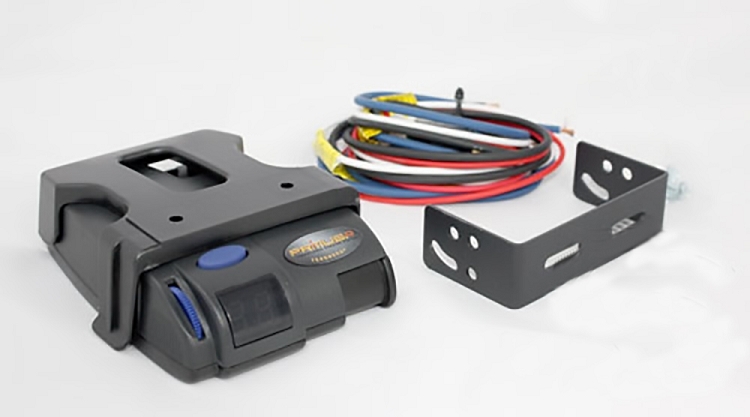 Snap-in dash mounting clip and removable electrical connector allow unit to be quickly stored when not in use. You will appreciate the digital readout depicting a secure electrical connection and the amount of voltage delivery to the trailer brakes. Primus meetings National Highway Traffic Safety Administration (NHTSA) regulations regarding tow vehicle/trailer light activation. It also offers a 15 year warranty (some conditions apply). The Primus™ is available in graphic or clear models. Utilizes the primary motion sensor of Prodigy and has a one step "Point and Go" set-up. Made for up to three-axle trailer brake systems. 15 Year warranty (some conditions apply).